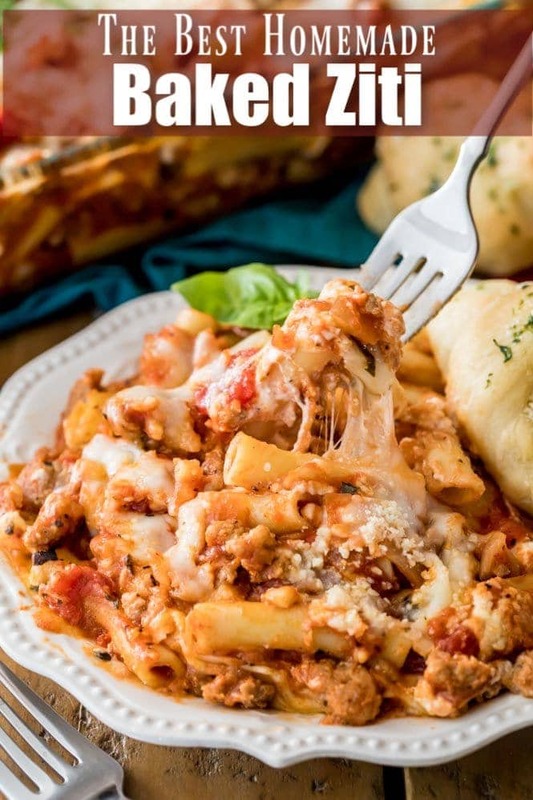 A saucy, cheesy Baked Ziti Recipe! 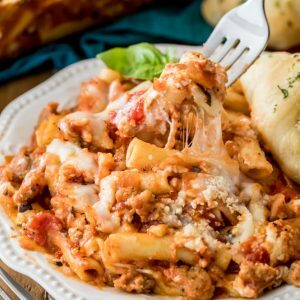 With a robustly flavored homemade tomato sauce (made with Italian sausage), ricotta, and melty, bubbly mozzarella cheese, this is comfort food at its finest. I’ve made this a couple times, I love the sauce. It’s delicious!! Sooooo good-thanks for sharing! I made this and was very well-liked! Leftovers were just as good. 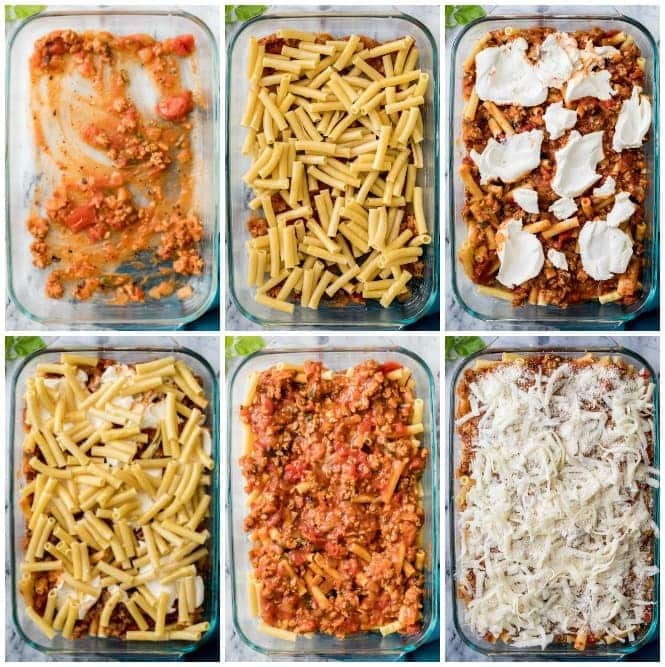 I plan on making this instead of a lasagna for guests and as meals to give to people because it was so much easier to make and much tastier! I made ahead of time, placed in fridge, then let warm up on counter before baking later on. Delicious! 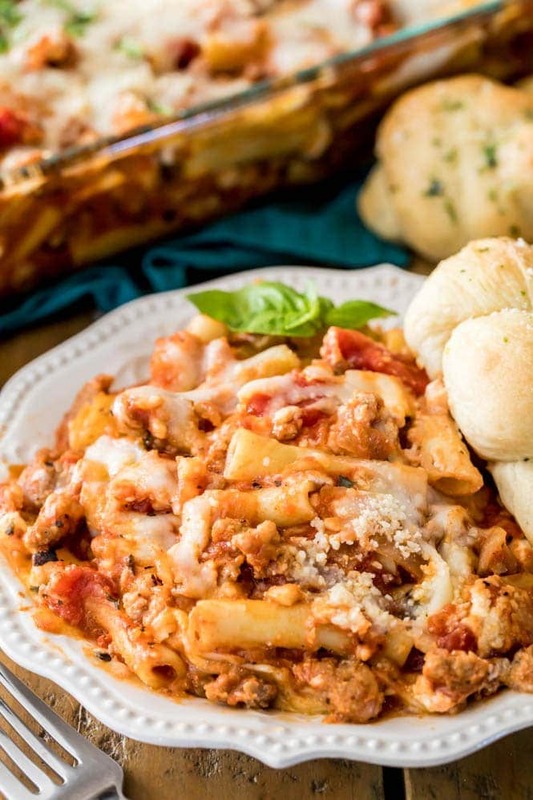 Your Baked Ziti recipe is perfectly delicious and full of flavor! My husband and I enjoyed it very much. Thank you for the easy to follow instructions. This is delicious! 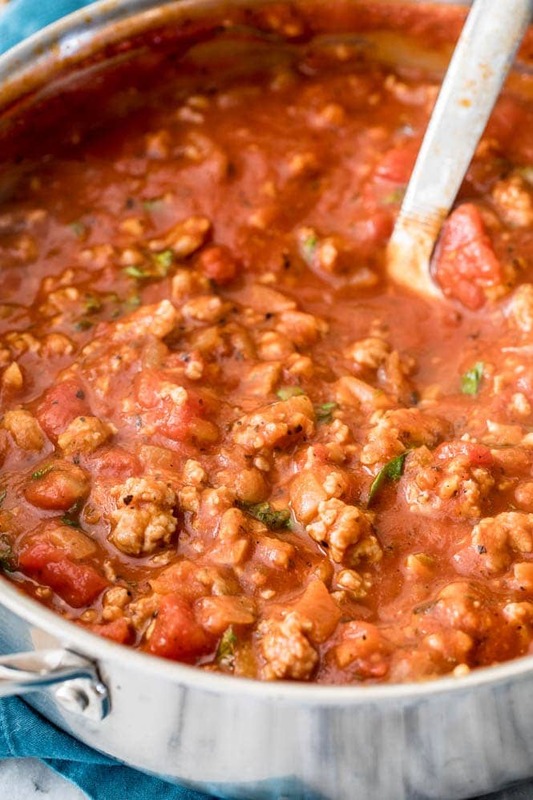 I made it as close to the recipe as I could – didn’t have the fresh basil, but I put some dried basil in the meat sauce. I did add meatloaf mixture and fresh mushrooms along with the Italian sweet sausage. How much dried basil if you don’t have anything fresh basil? I just sprinkled some in the sauce. I taste as I go, but I think I used about a tblsp. Start with less, and add to taste. I just made your most delish baked ziti and boy-o-boy was it ever! So yummy and cheesy and AMAZING! I subbed ground beef for sausage b/c that’s what I had in my fridge and I didn’t want to make yet another store run. Anyways… we loved it and love your savory recipes! My diet on the other hand.,, not so happy…LOL! Can I substitute with ground beef instead of Italian sausage? In the instructions, Step 1 & Step 2, we’re buttering the same 9 x 13 casserole twice! That being said, it sounds wonderful and I’m gonna be making this tomorrow! I’m so happy to hear that everyone enjoyed, Noya!! Thanks for letting me know how it turned out, and Happy Birthday to your mom! this is delicious; Liked it. I’m making this for tonight. A New England Delight! haha. I especially enjoyed reading your write up… got a chuckle too. Have a great week, stay warm and cozy! Thank you! 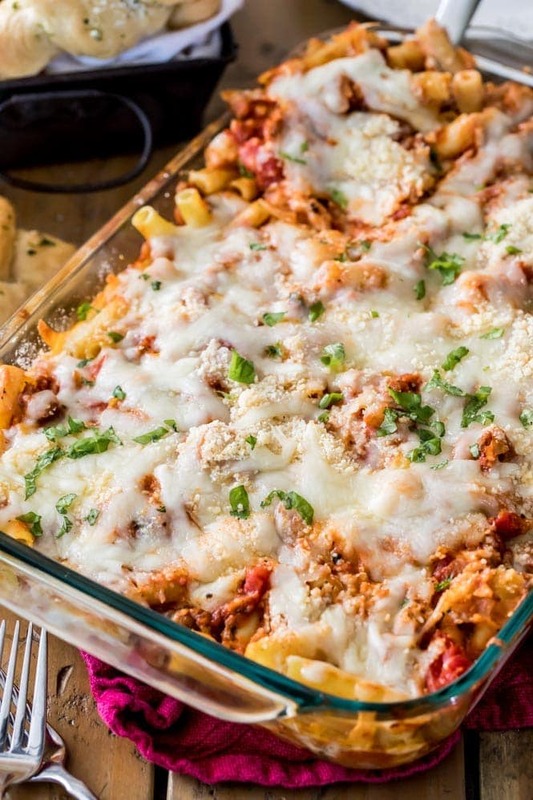 This ziti looks delicious! On my way to the store to buy ingredients to make for dinner tonight-perfect meal for a 30 degree day in the north east! 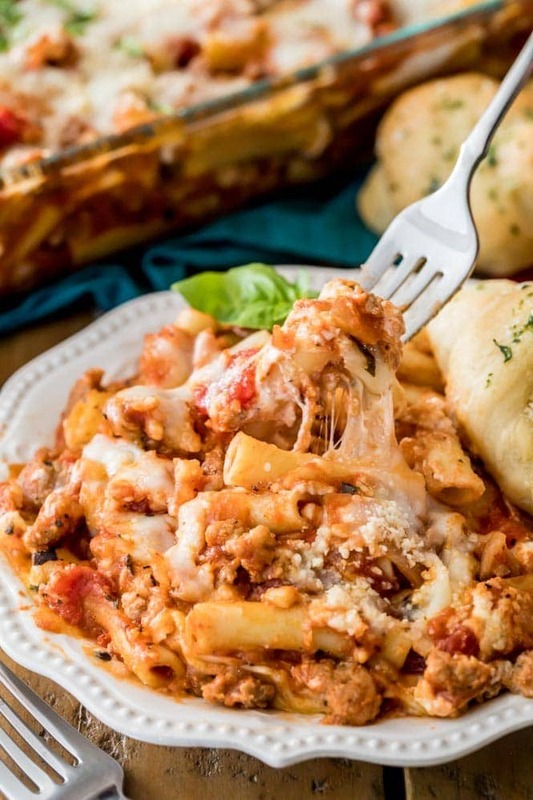 Baked Ziti is my favorite dish! I can’t wait to try this recipe!